Note: Power Query is known as Get & Transform in Excel 2016. Information provided here applies to both. To learn more, see Get & Transform in Excel. 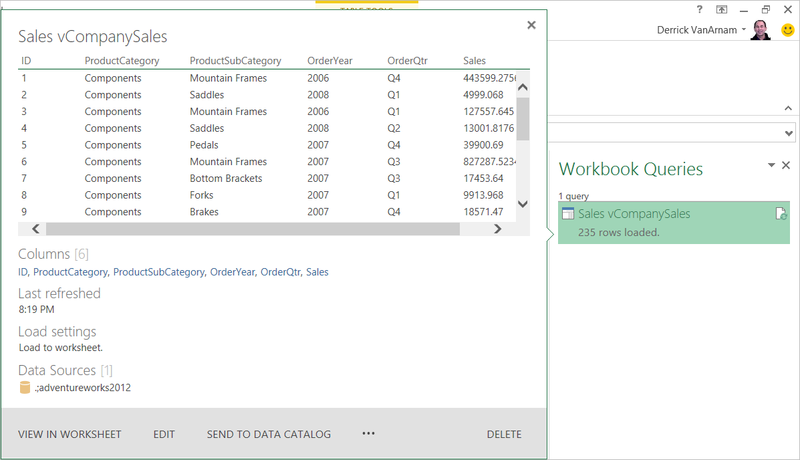 Data Catalog capabilities in Excel and Power Query will stop working on March 4th, 2019. Users will be able to consume content already published to the Data Catalog until that date. However, starting on December 3rd, 2018, users will not be able to publish (share) new or updated queries into the Data Catalog. Starting on August 1st, 2018, we will stop onboarding new customers (tenants) to use this feature. We recommend downloading your shared queries so you can continue using them outside the Data Catalog beyond March 4th, 2019. You can download the full definition of your queries from the My Data Catalog Queries task pane, using the Open option for each of the queries. 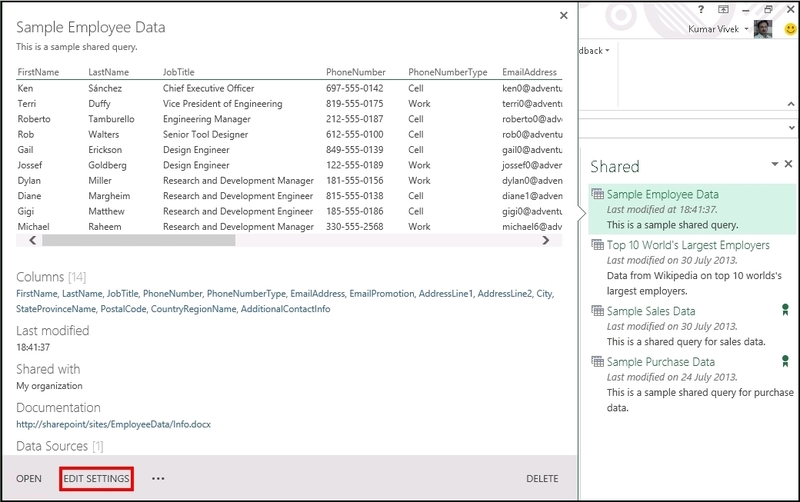 With Power Query , you can update a shared query with updated metadata added. You can also edit permissions to a shared query, to grant access to additional users within your organization, or to remove access from users. You can update a shared query or just update the query metadata (settings) such as name, description, and query sharing permissions. Sign in to Power BI from Power Query, if you are not already signed in. In Excel, on the POWER QUERY tab, select Sign In. In the Sign In dialog box, click Sign In, and then enter your organizational account information that was used for signing up for Power BI. Important: Signing in to Power BI using your organizational account enables you to view your shared queries. You cannot view your shared queries in Power Query if you are not signed in to Power BI. On the POWER QUERY tab, select Shared. The Shared pane displays all the queries currently shared by you. The queries are sorted by the date and time when they were shared or last modified with the most recent one at the top of the list. In the Shared pane, point your mouse or click on a shared query name that you want to edit. A preview fly out screen for the shared query appears. Click OPEN in the preview fly out screen. The query definition is opened in Excel, and the query is executed to import the query’s data into a new worksheet in Excel. You can then update the query definition by filtering and shaping it as required.. For more information about filtering and shaping the data in your query, see Filter, Shape, and Transform the Imported Data. After you improve the data referenced by your shared query, on the QUERY tab, click Send to Data Catalog. In the Send to Data Catalog update your query definition, and click Update. Sign in to Power BI from Power Query, if you are not already signed in. In Excel, on the POWER QUERY tab, click Sign In. In the Sign In dialog box, click Sign In, and then enter your organizational account information that was used for signing up for Power BI. On the POWER QUERY tab, click Shared. In the Shared pane, point your mouse or click on a shared query name that you want to edit. A preview fly out screen for the shared query appears. Click EDIT SETTINGS in the preview fly out screen. The Update Query dialog box appears with the metadata of the query that you specified while initially sharing the query. Edit the metadata information in the Update Query dialog box as required. In this case, we have changed the sharing level from specific people and security groups to all the users in the organization by selecting My organization. In the Update Query dialog box, click My organization. Note: The Certify this query for others check box is visible only if your user account is a member of the data steward group role in Power BI. Your Power BI Administrator can add a user to the data steward group role using Power BI Admin Center. What is Power BI administration?